Heat oven to 400°F. Mix flour, 2 tablepoons sugar, the salt and baking powder in medium bowl. Cut in butter, using pastry blender or crisscrossing 2 knives, until mixture looks like fine crumbs. Pat mixture firmly and evenly in bottom and halfway up sides of ungreased square pan, 8x8x2 inches. Spread peaches in crust in pan. 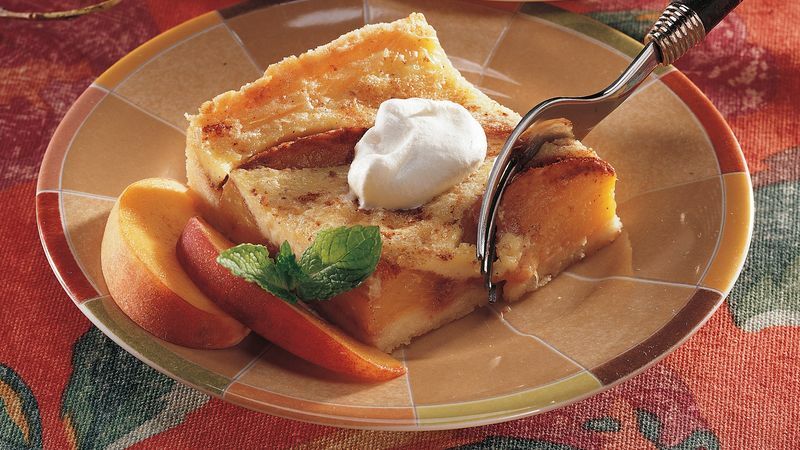 Mix 1/3 cup sugar and the cinnamon; sprinkle over peaches. Bake 15 minutes. Beat egg yolks and whipping cream until well blended; pour over peaches. Bake 25 to 30 minutes or until custard is set and edges are light brown. Serve warm. Store covered in refrigerator. Pronounced “KOO-khehn,” this German-inspired dessert also makes a great breakfast or brunch dish. Half a 16-ounce bag of frozen sliced peaches, thawed and drained, or a 16-ounce can of sliced peaches, drained, can be substituted for the fresh peaches.